You’ve built the benchwork, laid the trackwork, did all the wiring and connected your DCC to your locomotives so they can move at any rate of speed or in any direction and now one of the final steps is left, building model railroad scenery. The first step to remember is the theme and era you’ve chosen for your model train layout. Also, keep in mind the type of model railway, is it a prototype or a scratch built model railroad? This will determine whether you’ve got a choice in the scenery such as a scratchbuild or if it’s a replica build that does not allow for creativity but elaborate details to maintain the super realistic look of the real thing. 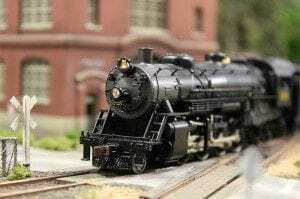 The use of “forced perspective” is one of the greatest model train scenery techniques utilized. For example, using larger trees in the foreground and progressively adding smaller and smaller trees the further away the layout is from the tracks, gives the illusion that a great distance is separating the track from the mountains and trees in the background. Another useful tip is to add smaller sized buildings the further back from the tracks. This process creates the “forced perspective” of layout scenery. A static grass applicator is needed if you want to use static grass, which stands up and looks very realistic. A spray bottle is good for wetting scenery before you glue it together. Usually, with most scenery, you must wet it before using an eyedropper or similar tool to apply glue. Because it’s already wet, the glue will spread through it, and when it dries it will all be fixed in place, rather than being loose. If using foam to build scenery, using a hot wire or bladed cutting tool can make the job less messy than using a serrated knife or other mechanical tools. Be sure to use a respirator or work outside, since the fumes can be toxic. To gather the right accessories for your layout scenery, visit your local hobby shop and start researching the brands for the fundamental aspects of scenery, such as imitation groundcover, grass to rock molds, trees and shrubs, scenic backdrops and terrain. Don’t fret if you can’t afford it; many model scenery projects can be completed with materials that you already have laying around the house or that you can find in your backyard. Building rocks for your model railroad have a huge variety to choose such as casting plaster rocks using rubber molds and painting them. After the Plaster of Paris is cast into molds and setup by hardening into the desired shape of the rock, the next step is to paint the rocks using acrylic paint. The types of painting techniques that are helpful when building model railroad scenery are washes and dry brushing. Washes are to flood an area with a thin solution of paint, using a large brush. Once the base color dries, apply a very thin wash of a dark color that will settle into the books and crannies thus simulating natural shadows that you see on rock formations. For dry brushing, you drip the comb into the paint and wipe it nearly dry by using a towel so only a tiny bit of paint remains. After doing this, you then drag it gently over the raised surfaces to give it the look. HO Model Railroad Scenery is the most popular scale of scenery and carries the largest variety of different types of scenery items. Some of the most famous backdrops look the best when using HO train scenery. If you are a true artist, creating unique backdrop paintings can really separate your layout from anyone else’s and add a unique flavor. 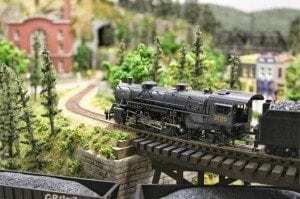 When putting HO model railroad scenery together, remember to not take it too seriously but try out many different types of buildings, trees, and shrubs. Building a grassy knoll for ho train scenery is by far one of the simplest and inexpensive ways to add scenery to your HO model train layout. You can simply take some old newspapers and crumble them up into the shape of a basic hill. From there flatten the top part out and glue it down. Finish it off by adding ground cover and foliage. There is not one right way to build but there are only two ways it can go and that is either vertical or horizontal. If you don’t have a ton of space to build out hills and tunnels horizontally due to limited space, you can always go upward. The main things that matter is creativity and structure placement when building vertically.